Over 2,500 international runners took part, with first place going to Demi Samuel Getachew of Ethiopia. The Tel Aviv Samsung Marathon took place on February 22, 2019. 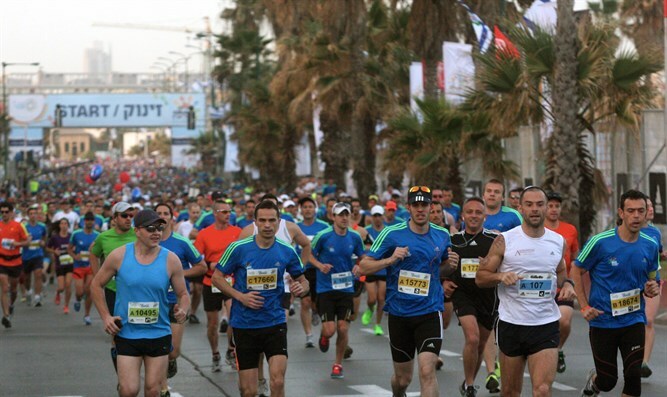 40,000 runners participated in Israel’s biggest sporting event of the year. 2,500 international participants from China, Germany, Poland, Russia, US, UK, Italy, France and more hit the city to take part in the Tel Aviv Samsung Marathon, including a large delegation of elite international runners attempting to break the marathon record and potentially win a prize of $40,000. The standing record was set in 2015 by William Kiprono Yagon from Kenya at a time of 2:10:30. Demi Samuel Getachew of Ethiopia won this year's full marathon, crossing the finish line after two hours, 14 minutes and 30 seconds. Margaret Wangui Njuguna of Kenya won the women’s race in two hours, 40 minutes and 25 seconds. This year, the Tel Aviv Marathon took participants on a stunning 42km route winding its way through the beating heart of the city. Runners started at the Tel Aviv Expo in northern Tel Aviv and then followed the route through many of the city’s most celebrated neighborhoods, including Sarona Market, Rabin Square and Old Jaffa - one of the most ancient port cities of the world. The route also took runners along the white sandy beaches of the Mediterranean Sea. The Tel Aviv Samsung Marathon continued this year to support social and community engagement, and encouraged marathon runners to take advantage of their participation to raise funds for charity. This year- Samsung pledged to match each calorie burnt by the runners with a similar calorie-rich food product it will donate to families in need. The calories were calculated on screens throughout the track. For example, if 500,000 calories were burned in total, these will be converted into thousands of food products that together contain 500,000 calories. Ron Huldai, The Mayor of Tel Aviv-Yafo, said "The Marathon, currently celebrating its 11th year, has become an acclaimed International event, standing in line with the great marathons in the world. We welcome the 2,500 runners who joined us from abroad to participate in the unique experience that we create annually in the city."